We all know cigarettes are bad for us. Yet, tobacco is still the largest preventable cause of death in the United States. According to the Centers for Disease Control and Prevention, 484,000 Americans lose their lives to cigarettes annually. Medical Daily says 3,200 Americans under the age of 18 smoke their first cigarette each day. If you're a cigarette smoker, you may change your mind when you learn what's actually in cigarettes. 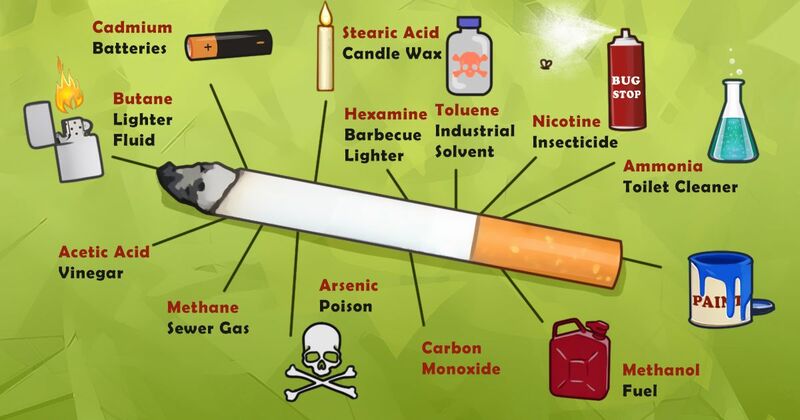 SmokeFreeForsythe.org has a fantastic graph, featured below, that shows the harrowing ingredients used in cigarettes. The names hexamine, stearic acid, and cadmium might not mean much until you see the image below and understand its meaning. If the diagram above scared you, you should be scared. The reality is what you thought. 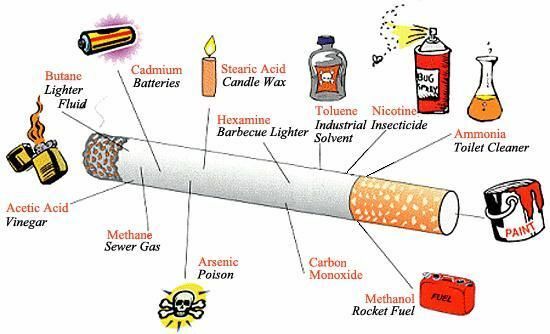 Cigarettes contain cadmium from batteries, butane from lighter fluid, methane from sewer gas, and arsenic from poison. They also contain ammonia from toilet cleaner, methanol from rocket fuel, hexamine from barbecue lighters, and stearic acid from candle wax. Yuck! But perhaps you are a chronic smoker, and this diagram just isn't cutting it. Keep reading as we have one more idea for you. If you need any more reason to quit, consider how quickly the body recovers after you put the pack away. The American Cancer Society explains that just 20 minutes after smoking, your heart rate and blood pressure drop. It doesn't stop there. Two weeks later, your circulation improves and your lung function increases. One year after you stop smoking, your risk of heart disease drops in half. There are some other immediate changes you'll notice right away. Food will taste better, your breath, hair and clothes will smell better, and your teeth and fingernails will turn from yellow to white. It won't be easy, but the benefits are immense. You'll look and feel miles better. Has this article helped you quit smoking? Tell us your success stories when you SHARE this article on social media!